Hello folks,The wife and I make each item or order that comes in. We personally make and ship your item in 3 or 4 business days. We ship our items through USPS. Folks all are items are hand crafted??? largest part of our items are personalized with what the customer wants on it. Its very hard if not impossible to resell a item that has been personalized. In other words if you were doing what we do with our hand crafted items then surely you would understand why all sells have to be final. It is here that we spend our days playing with our grand children and making our own brand of pet items and other items for good folks. I have been wood crafting for well over 35 years now. The wife who is also my best friend have been married for 36 years. I am very proud to say that we are an American mom and pop shop where everything is personally made by us. We make and sell our items here in the mountains and numerous on line auction sites and our own website. We have been selling our pet brand on my site since 1991.
we are both now retired and still crafting our brand of items from dawn to dark. God bless you good folks...and have a very good day. Ole Woodcrafter'...Serving you and your pets for over 38 years. Hello folks the Ole Woodcrafter here. Here in the beautiful Blue Ridge mountains of Virginia my wife and I make these beautiful feeders for your pets. We have been crafting for good folks like yourselves for 38 years now. Give your furry friend some help while eating with one of these wooden pet dish feeders. Not only that I personalize each feeder at no cost by burning the pets name into the front of the wood feeder. If you should have two pets I'll burn the other name also at no cost! Folks the burning of the pet names is done my hand at a temperature of 1200 to 1800 degrees... an artwork called Pyrography which means in Greek.. writing with fire... another craft that I have been doing for 38 years... and I am more than happy to do this for you at no added cost. Not only that, two 2 qt stainless steel pet dishes comes with the feeder. These beautiful pet dish feeders that will help your pet eat due the fact that it stands 8 inches higher off of the floor. since the bowls are in the feeder the dishes won't be pushed about while the pet eats. 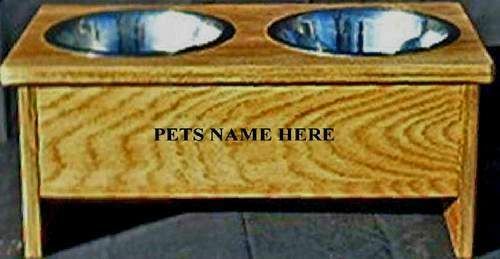 The pet dish feeder is 20 inches long, 10 inches wide, 8 inches high and made from beautiful Red Oak hardwood THATS RIGHT ITS NOT PLASTIC! The edges are sanded smooth and rounded so your little friends won't be harmed... Top quality craftsmanship through out. YOU GET... STAINLESS STEEL PET BOWLS.. I STAIN THE FEEDER.. I PUT 3 COATS OF POLYCRYLIC FINISH ON THE FEEDER.. I PERSONALIZED THE FEEDER WITH YOUR PETS NAMES. FOLKS I HAVE BEEN DOING THIS FOR 38 YEARS NOW AND YOU MUST ADMIT THIS IS A GREAT DEAL! I OFFER Early American, Cherry, Golden Pecan, Red Mahogany, Special Walnut, Colonial Maple, English Chestnut, Red Oak, Ipswich pine Golden Oak. GOLDEN OAK IS WHAT IS PICTURED. JUST LET ME KNOW AND I will be more than happy to do that for you. Please give your pets a big hug for me..
please don't worry I will comfirm back to you as soon as I can.